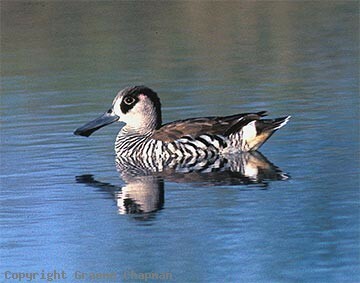 Pink-eared Ducks are popularly known as Zebra Ducks because of their striped plumage. 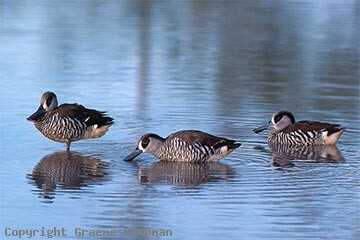 Pink-ears occur all over the Australian mainland and occasionally in Tasmania. They are great nomads and wander the interior in search of floodwaters - shallow water is their mainstay where they sieve most of their food from or close to the surface. 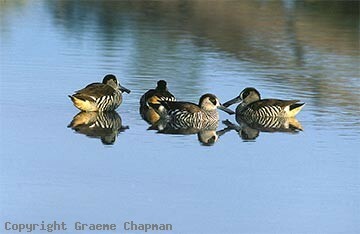 Only in times of drought do they retreat to deeper more permanent swamps close to the coast. They are filter feeders - a layer of lamellae in the specially adapted bill filter out the fine food they feed on - plankton, algae, tiny insects and other marine life and small floating seeds. 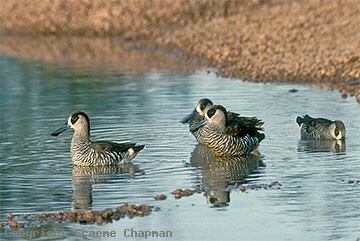 When in groups, Pink-ears are often seen swimming in tight circles which presumably help to stir up food and make it more available.